We still have a mailing list of people looking for the Snoozems animals. We do have the blue Snoozems dog for sale in our store right now. I’m looking for a large heavy beige bear called LITTLE SNOOZEMS. He has a tan velour muzzle with brown nose and paws. 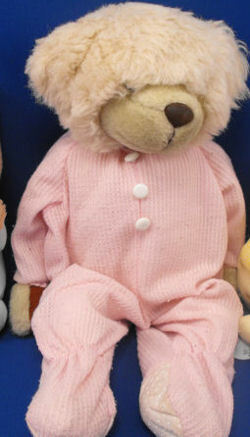 He’s wearing a pink thermal sleeper with white buttons and white footies. The bear was made by HAPPINESS EXPRESS. She fell in love with him straight away, and he hasn’t left her side since! He was with her on her very first day of Daycare, she takes him to play center, she has tea parties with him, he goes on play dates with her, and he’s especially cuddled up close when she’s in bed or in the car. She even uses his little blanket to wipe her tears when she’s sad. She calls him “Sleepy”, and it’s easy to say he is the favorite! Poor “Sleepy” has had many adventures, and he is getting very old. He has many rips that have been stitched up, he has paint that refuses to come off and even a spot of grease that got on him when my daughter was helping her grandad fix his car (Sleepy had to help, too, of course). I am now pregnant with my 2nd child (a boy) and would LOVE to get a Snoozem for him as well! Or if he is not interested in it, it would be a great back up in case, God forbid, my daughter ever loses her Snoozem (although I don’t think her Snoozem could ever be replaced, it might make her feel a bit better if there is another one). I have been asking around everywhere and been looking on many websites. I hope you can help me!! I have been searching for both the snoozems express dog and bear for a long time. I purchased both for my son and niece when they were babies and they both loved them so much that they had to sleep with them every night for years. Please if you have either one you would like to sell let me know.